While the eye of Hurricane Alex is clearly going to pass well south of Brownsville, or the TX/Mexico border, his impacts are already being felt. In the radar loop above, you can see the eye of Hurricane Alex well to the southeast of Brownsville, moving west-northwest. Over south Texas and in the Brownsville area, two intense feeder bands are moving over the area. These feeder bands are on the northwestern quadrant of Hurricane Alex, and are already responsible for producing three tornadoes in the area. More tornadoes are possible throughout the rest of today as these storms continue to train over the same area. The other threat is significant, life threatening flooding as very heavy rains continue to batter south Texas. Radar estimates suggest between 3 and 7 inches of rain have already fallen across south Texas. Much, much more is on the way. So even though the center of Hurricane Alex will pass well south of Brownsville, they will continue to experience significant impacts from this brutal storm. Alex strengthens into a category 1 hurricane…. A couple things have changed since yesterday. 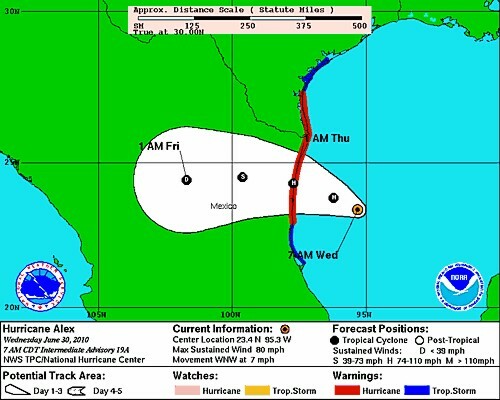 Around midday yesterday Alex accelerated towards the northwest and west-northwest. This turn came sooner than expected, and has not allowed him to gain the latitude some models suggested. This faster turn towards the west also put Alex under the influence of a ridge of high pressure centered to his north, blocking any further chances of a more northward turn. As a result, Alex is no longer expected to reach the Texas/Mexico border, and any U.S. hurricane chase prospects are gone for those who were preparing for one. The other change is Alex has finally strengthened into a category 1 hurricane, with maximum sustained winds of 80 mph. His central pressure has dropped to 959 mb, which is not representative of 80 mph winds. So, one would expect some rapid intensification today before landfall early Thursday morning, so the winds will match the low central pressure. And this shouldn’t be a complete surprise when this rapid intensification occurs. After all, historically, hurricanes approaching the Mexico or Texas coast exhibit rapid strengthening just before landfall. Thus, the potential does exist for Hurricane Alex to reach close to category 3 status before landfall, with maximum sustained winds in the 110 to 115 mph range. But the main impacts from Alex over Texas will be flooding rains, and maybe some tornadoes today across south Texas as the northern feeder bands move in. The tornado chasing season may be winding down, but the hurricane chasing season is just starting. I am not a hurricane chaser, but other members of the Stormgasm team are, and are closely monitoring Tropical Storm Alex. A trip down to the coast of Brownsville may be in store for some chasers who are eager to begin their hurricane chasing season. Tropical Storm Alex is near hurricane strength, with maximum sustained winds of 70 mph. He is moving at a moderate speed to the north-northwest towards the southern Gulf of Mexico. Water temperatures across the Bay of Campeche and the southern Gulf are very warm and the wind shear environment is very weak. These are conditions that support Alex strengthening into a hurricane over the next couple days. That is exactly what the National Hurricane Center is forecasting, having Alex peak as a category 2 hurricane upon landfall early Thursday morning. Residents of Brownsville, TX should be on alert for the potential for devastating flooding, high winds and a damaging storm surge. After all, the northern side of hurricane Alex will be the side that packs the highest winds, biggest storm surge, and most flooding rains. Tropical Storm Alex is a rather large storm, covering a large portion of the Gulf of Mexico. This may be one reason why computer models do not show Alex strengthening into a major hurricane, despite a favorable environment. But residents across south Texas (especially Brownsville) should be on high alert. Historically, hurricanes approaching the Mexico or Texas coast can strengthen significantly within 24 to 12 hours before landfall. These storms can go from a weak category 2 hurricane to a strong category 3 hurricane in less than one day, with winds sustained near 130 mph. So, this is something to be aware of as Alex turns more westward over the next day or two and approaches the northern Mexico and extreme southern Texas coast. May was a big month for large, photogenic tornadoes across the Great Plains. After each big tornado day, myself along with many other chasers would pronounce that day to be the ‘day of the year’. We said that because it’s rare to have more than one day in a year that produces amazing, long lived photogenic tornadoes. Then, a few days later, a bigger and better day would unfold, producing an even more photogenic, long lived tornado. This trend of more and more amazing tornadoes occurring after a day we thought couldn’t be beaten took a short break in early June, at least from frequency. Although, the tornadoes that occurred on June 5 in Illinois certainly make a good argument that the season kept on giving. I mean seriously, awesome tornadoes just kept forming! After the June 5 Illinois tornado day, the weather pattern took a five day break from producing amazing tornadoes. 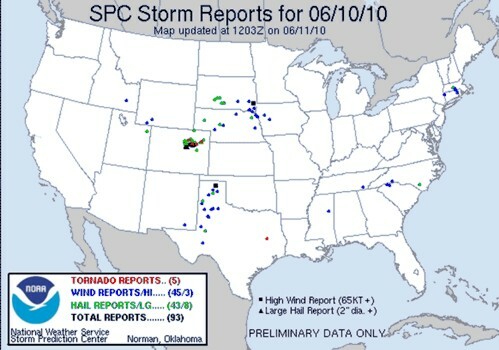 But not to worry, since June 10, there have been 184 tornadoes reported on the SPC storm reports page. That includes at least two separate days (June 16 & 17) that produced some of the most photogenic tornadoes of the year across South Dakota and Minnesota. Both days easily rival the best tornado days seen in May. So, I guess the question is, when does it end? Has this season finally peaked, or do we have another day that will rival the handful of amazing tornadoes days seen from mid May through late June? From a couple chaser reports I’ve heard from, second hand, and from Stormtrack, it sounds and looks like yesterday (June 16) was one of the best tornado days of the year! Unfortunately, I also hear a few chasers were stuck on a flooded road and missed these tornadoes. A couple different chasers have reported seeing 16 tornadoes in northwestern South Dakota on one, nearly stationary supercell near Dupree. Apparently, there were approximately two full hours of continuous tornado action. These tornadoes came in all shapes and sizes, and were extremely photogenic. Congrats to those who witnessed such an amazing, once in a lifetime tornado event. Luckily, these tornadoes passed just outside of Dupree, sparing the community from complete devastation, from what I understand. I also hear, second hand, quite a few storm chasers were not able to intercept these tornadoes due to extreme flooding on highway 212, only a few miles west of Dupree. 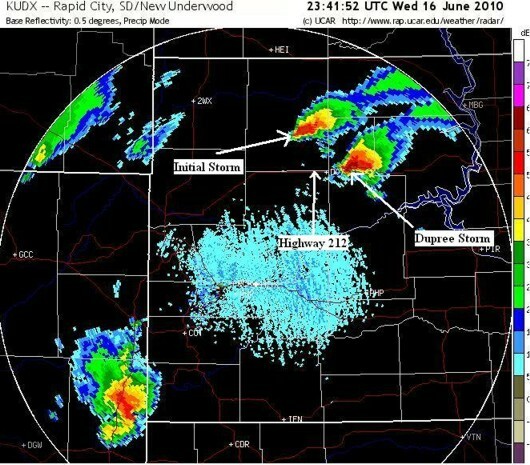 Essentially, these unlucky chasers were on another tornadic supercell further to the northwest when the Dupree storm formed, south of highway 212. I’m assuming these chasers did not leave the initial storm fast enough to intercept the Dupree storm. I say this because the Dupree storm moved north to highway 212 and then stalled, dumping several inches of rain on the highway. Any chaser that left the initial storm too late would have to dive south on 73 and then east on 212, west of Faith. But, by the time they turned east on 212, the Dupree storm had likely already dumped tons of rain between them and the tornadoes, causing extreme flooding over the highway. This means chasers were probably stuck on highway 212 only a few miles to the west of incredible tornadoes. They were probably unable to proceed and unable to see the tornadoes, due to the massive, stationary rain/hail core of the Dupree tornadic supercell. I do not know how long any of these chasers were stuck on the highway. In any case, what an awful situation and I hope everyone is alright. Thursday, June 17 still looks good for tornadoes, some violent, across southwestern Minnesota. Depending on how strong the CAP is, northwestern Iowa could get in on the action as well. This has the potential to be a very big day for tornadoes. Saturday looks more complicated and less certain. Computer models are having a hard time handling individual shortwaves as they are forced over the strong ridge, which is centered over the South and Southeastern U.S. As a result, the latest guidance has the warm front further south across eastern Nebraska and Iowa. The placement of this front will determine where the tornado risk is for Saturday afternoon/evening. Despite the model issues, there should still be 4000-5000 j/kg of CAPE along the warm front by late Saturday afternoon. As long as deep layer shear is supportive of supercells, the threat for both supercells and tornadoes will exist. We are now settled in an active pattern supporting persistent severe storm events across the Plains. In the near future, Thursday and Saturday both look potentially significant in terms of supercell and tornado threats. On Thursday (June 17), the region of interest is western/southwestern Minnesota into northwestern Iowa. There, a good combination of moderate to strong shear and extreme CAPE will support tornadic supercells. These storms will develop along and ahead of a north-south oriented front/dryline feature. Given the degree of low level shear present, several tornadoes, some violent, will be possible. The pattern is becoming more consistently active for severe storms and tornadoes, and I still suspect this trend will continue for the next couple weeks. There were quite a few tornado reports in eastern Colorado yesterday, and the same general areas are at risk again today for tornadoes. Then on Saturday, the focus for supercells and tornadoes shifts further south into the Texas and Oklahoma Panhandles. There, the combination of upslope flow and dryline mixing should initiate supercells in the late afternoon or early evening hours. Models differ on the strength of the 850mb jet, as well as how far south the cool front will advance. Additionally, models fail to develop CAPE values greater than 2500-3000 j/kg. Finally, surface and 850mb temperatures are forecast to be very warm, suggesting relatively high based storms, at least initially. All of these inhibiting factors and uncertainties are likely the reason why the SPC only has a slight risk for the Texas/Oklahoma panhandles. But, I imagine if more low level moisture were forecast to advect into the area, and models came into better agreement on the cool front movement and the strength of the 850mb jet, their risk for severe storms would increase. But, if the WRF model is correct in showing an axis of 35 knot southeasterly 850mb winds over the Texas panhandle with backed surface flow just ahead of the dryline, there will be supercells with at least a couple tornadoes on Saturday across the Texas panhandle. The time has come (even sooner than expected), and tornado setups this week and potentially lingering into the weekend are expected. Persistent, modest westerly mid level flow atop moderate upslope flow from the surface to 850mb will create ample shear for supercells and some tornadoes, from eastern Colorado to western Nebraska, eastern Wyoming and the Dakotas. High levels of low level moisture will bring moderate to high levels of instability (CAPE). However, the CAP will be an issue, and will likely limit the tornado threat on one or two of the coming days. But, the strong upslope component, combined with enough upper level support, should allow for one good tornado day later this week across the high Plains. Looking forward deeper into mid and even late June, severe storm setups (some tornadoes) will likely continue across the central to northern Plains. This is based on the MJO becoming nearly stationary across the Indian Ocean, among other things, allowing for an active Pacific jet to carve more troughs into the northern Rockies/Plains. So, while the best tornadoes of the year may have already occurred, there are still more tornadoes to be filmed this month across the Plains. Tornado Watches active Sunday, June 6. This is unusual for New England. Supercells are expected to develop over the next few hours from Philadelphia up through southern New England and eventually move through central and northern New England by this evening. 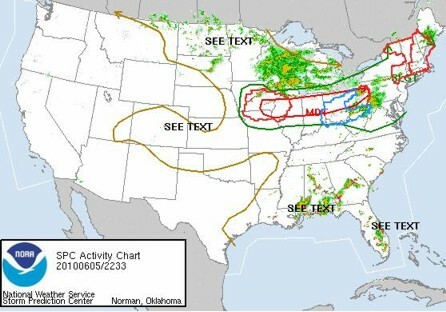 The combination of instability and wind shear present has prompted the SPC to issue tornadoes watches that stretch across the Northeastern states. This is a rare event, but even more so considering there were tornado watches over these same areas yesterday. The difference now is the low level wind shear is moderate to highly supportive of tornadoes within any discrete supercell. Storms will be racing northeast faster than 50 mph. So, if chasing wasn’t already nearly impossible considering the terrain and roads up here, the fast storm motion pretty much seals the deal. It’s not often there are two tornado watches issued to cover most of New England. These watches were active for most of the afternoon today (Saturday, June 5) and can be seen in the image above. IMO, conditions were only marginally favorable for tornadoes at best. But, certainly favorable for multicell storms and some supercells, supporting large hail and damaging winds. The setup with much more potential across the Northeast is coming tomorrow (Sunday, June 6). For that setup, the SPC has issued a hatched area for enhanced severe potential across southern New England, with a 30% risk for any form of severe weather. Below is an image showing there outlook. I couldn’t agree more with their forecast. From what I’m seeing, a strong upper level through will eject through New England on Sunday. Deep layer wind shear will be supportive of supercells. Given the expected storm motion of around 55 mph to the east/northeast, and the strong 850mb winds, tornadoes will be possible. The one issue will be the high degree of forcing from the intense upper level trough. This could cause storms that fire around noon, or in the very early afternoon, to quickly develop into a MCS (Mesoscale Convective System), or an intense squall line. Either way, the development into a t-storm complex would significantly reduce the tornado potential. However, the initial storms that form in southeastern NY into western CT will likely be supercells. For the hour or two when these storms are supercells, they should pose a moderate to high tornado threat given the low level shear present, along with the incredible amount of low level moisture available. Needless to say, for New England standards, tomorrow looks very interesting regarding severe storm and tornado potential!